Making campground reservations is an important part of RVing. Remembering the information or forgetting to ask certain questions about a campground can be a challenge. If you full-time, like we do, it can be even more difficult when you plan out months or even a year in advance. A Campground Reservation Log can help you organize your camping reservations. Download a copy of one we developed for our travels at the bottom of this post to help you in your planning. One challenge that you can face when you RV, is keeping up with your campground reservations. Sometimes, we have called multiple places in an area where we want to travel and gather information, only to forget which one was what. That is where this campground reservation log can be a handy resource as you search and compile information. It is also a great reminder of where you have been and maybe where you want to stay again. 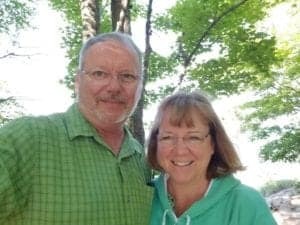 We like to ask certain questions about the campground and need reminding to get the answers while on the phone or website, so we don’t have to do it twice. Since we full-time RV, I made a 3-ring binder with the Campground Reservation Log pages and organized the tabs by month. If you prefer you could organize by state, If that is too many tabs for you, try regions to help organize your information. If you are traveling for a shorter vacation, then you could organize by destination. Campgrounds can fill up, especially during their season. Making the reservation in advance is good but I always like to know what the cancellation policy is in case plans change. We get our mail on the road so another important thing to us is if we can receive it there and what is the correct address so when we request our mail be sent to us, we get it. Also, making sure that your GPS will get you to the campground is an important thing to know. I don’t know how many times we have made a reservation and they have told us “Don’t follow your GPS!” and give us landmarks or alternate routes. I don’t want to take a chance and get stuck somewhere unexpected. Our rig is 42-foot-long and we pull a toad. Things could get hairy fast! Getting all the various rates for the campground can help you make a better financial decision about staying there. If you are looking to reduce expenses, often a monthly rate can save you money. You may choose to stay longer at that campground if it makes sense to do so. 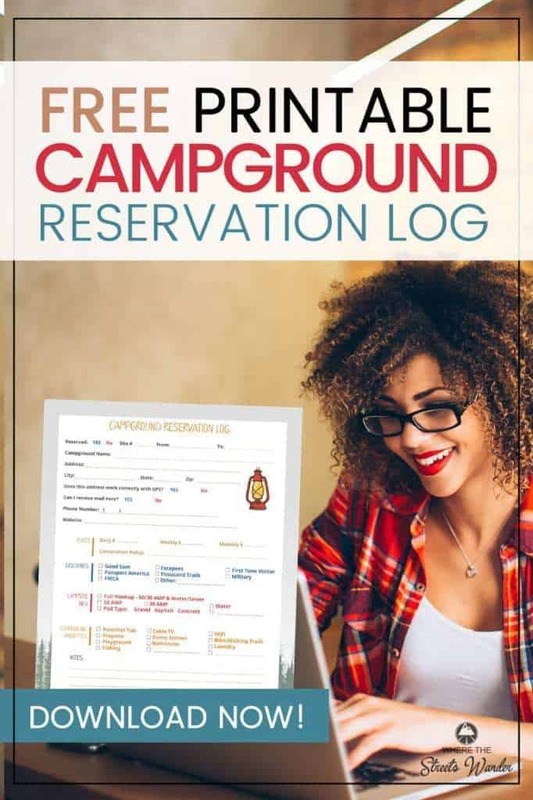 We developed this Campground Reservation Log that helps us in our RV Lifestyle. You can download your free copy by entering your email address below. We love to share with others and hope you can find a use for this form in your camping adventures. We use this in conjunction with the tips you can find here: RV Travel Planning Made Easy. This log is also used as a cornerstone in the travel planner developed specifically for RV travel. 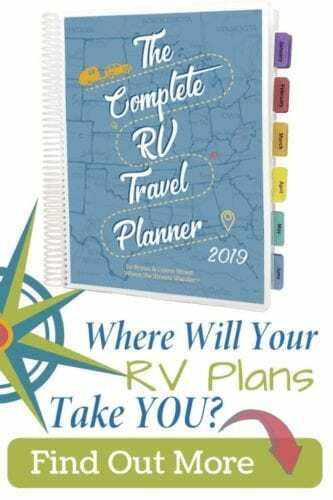 THE COMPLETE RV TRAVEL PLANNER is a travel planner for every part of your RV life. If you need a resource to keep all of your travel plans at your fingertips, you should check it out! Thanks, Terrie! We designed it out of our own need and the information that we kept asking questions about. I’m glad you like it and I hope it works well for you! If you have any suggestions, please feel free to drop us a line and maybe I can add it to the form. I wish you well on your planning! Great Information! Thanks for sharing. I always dread calling around to get campground reservations made. Zack, I know and we hate having to call back for that one question we didn’t get an answer to! If you have any ideas to add to make it better, let me know! I really like the spreadsheet concept you have developed. I haven’t downloaded yet but will shortly. Thank you Cindy! We have enjoyed using it ourselves. It keeps us from making several calls to the campground to gather all the info we need! 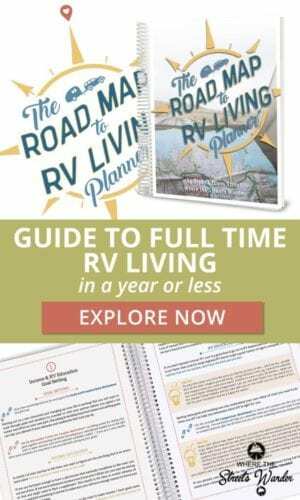 As a new rv night couple we have found this is one of the best tools we have purchased for our new lifestyle it helps us plan and to make memories it keeps us well organized. Thank you for developing such a great tool for new and experienced rv ers. Thanks! We appreciate the positive feedback! It’s nice to know it is useful for others! Happy Travels!